This machine is so handy you’ll wonder how you ever got along without it. 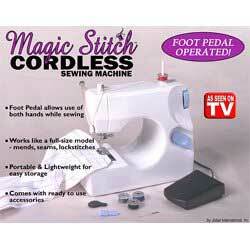 Quickly mends slipcovers, sews in zippers, makes fast alterations. Ideal for all fabrics. This table top sewing machine features an on/off foot pedal just like those expensive machines & includes 1-Metal Bobbin, 4-Plastic Bobbins with Thread, 1-Needle, 1-Threader, and 1-Spindle. Fast, professional quality stitching. Saves time and money.